Samsung Galaxy S5 hits the market starting tomorrow, 11th of April in 125 countries concurrently. Each of the 150 countries get the device within the 24 hour day based on their timezone in what Samsung calls S Carpet. 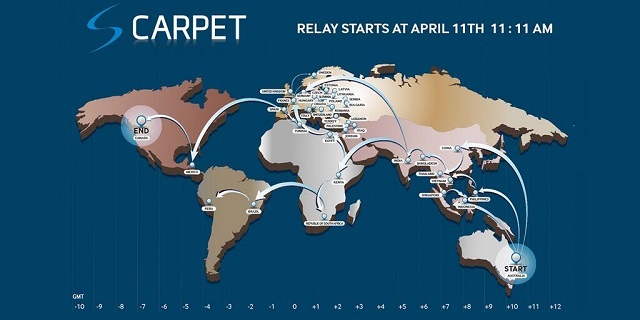 S Carpet is a 24 hour relay that starts East from Australia going east as the sun rises for each countries as per their timezones to the west ending in North America. Time for commencement is 11:11 am on 11th April. Kenya is one of the countries among the four countries getting the relay tomorrow. The others are Egypt, South Africa and Tunisia. The launch for Samsung Electronics East Africa (SEEA) is today with the countries served by the Nairobi office also participating in the launch later today. These include Kenya, Uganda, Rwanda, Tanzania, Ethiopia, North Sudan, South Sudan, Somalia, Djibouti, DRC and Burundi. The Galaxy S5 was launched earlier in the year on the sidelines of Mobile World Congress in Barcelona at the end of February and hits the market worldwide a month and two weeks later. Safaricom is one of the retail channels that offered the device for pre-order in Kenya and has confirmed that the device will be available in their shops starting tomorrow 11th April. Of course the pre-order people get it first. Usually, the first stock gets out fast as the scramble to get the hottest smartphone of the season goes on. Safaricom says they got 300 pre-orders of the smartphone which was bundled at a price of Kshs 75,000 with free 3GB internet and a Gear Fit which outside of the deal is priced at Kshs 22,000.